YouBIM is a Software as a Service (SAAS) cloud-based solution for today’s most demanding facilities. YouBIM utilizes a 3D immersive environment for navigating your property. Facility maintenance needs can be identified and assigned faster than ever before, while providing the facility technician with complete information about the service environment. As a function of maintaining a facility, YouBIM harvests the metadata from the source BIM model and allows the attachment of OEM documents to smart objects in the BIM dataset. This provides instant access to critical information regarding specific building components. YouBIM manages scheduled maintenance and abrupt building component failure to ensure a smooth running facility. In the past few years, BIM has had a major impact on design and construction markets by creating smarter, better-built buildings. YouBIM takes this advanced practice and applies it to FM. 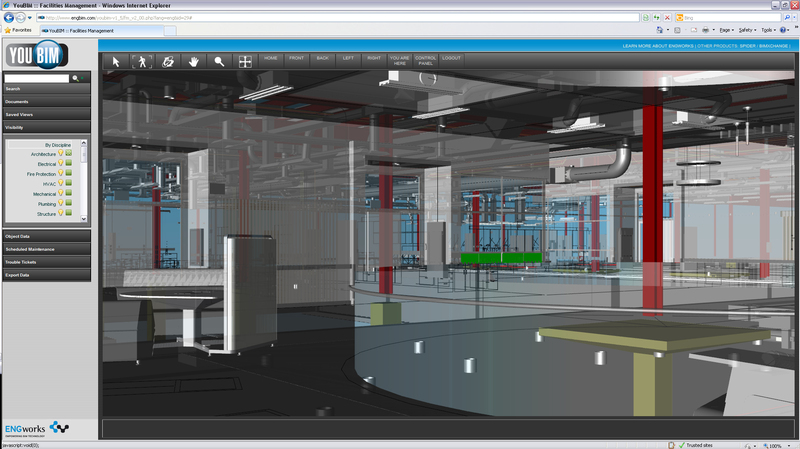 YouBIM is able to tie models from the native BIM authoring software solutions to an FM database and publish them online. Using an easy to navigate model, FM staff can inspect a device in the building before ever stepping foot outside their office. YouBIM can be used in a facility that already has more granular CAFM solutions, such as ArchiBUS, Trirga, or Maximo. YouBIM integrates with any of these systems and creates a navigable 3D environment while retaining the full power of the existing CAFM. Inside the YouBIM environment, simple facility maintenance needs can be handled with just a few mouse clicks. YouBIM keeps an updated history of your facility, even when you assign support issue tickets for equipment or change metadata and OEM documents.